New Zealand dusky dolphin (L. o. un-named subsp.). Dusky dolphins in South Africa Photo courtesy of Simon Elwen/Sea Search. Of the species with which dusky dolphins share their range, the larger Peale’s dolphin in South America has a similar head shape and colour pattern, but it is much darker, particularly around the face. The light patch at the front of a dusky dolphin’s body is similar to that of a common dolphin, but the latter has a much longer beak and at close range the colour patterns are easy to distinguish. On the west coast of Africa they can be confused with heavisides dolphins from a distance, but their surfacing and swim patterns, generally larger group size and colour patterns allow them to be distinguished on closer approach. Dusky dolphins are limited to the Southern Hemisphere, and the four distinct sub-species are non-overlapping, and in some cases, separated by entire ocean basins1. They appear to prefer coastal waters associated with the continental shelf or slope, but can also be found over deep water where it occurs close to shore2. Dusky dolphins appear to be adaptable in their feeding strategies and preferred prey2. In Argentina they forage mostly during the day, using cooperative strategies to herd and catch schooling fish in waters over the continental shelf2. In New Zealand, on the other hand, dolphins often rest during the day and move offshore at night to feed in deeper waters on prey associated with the deep scattering layer. But these same dolphins can also feed during the day when prey is abundant closer to shore3. Preferred prey can include lantern fish from the deep scattering layer, anchovies, pilchards, mackerel and various species of squid2. Dusky dolphin feeding, which may vary by time of day and by season, is often marked by spectacular acrobatic behavior, including chases and aerial displays. These displays are thought to help coordinate the movements and prey herding in the dolphin groups that can number hundreds or even (in New Zealand) thousands of individuals3-5. 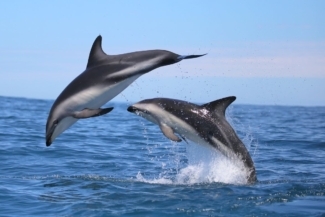 Dusky dolphin groups vary in size from only 3-5 individuals to the more common 10-20, but can also reach up to 2000 animals off of Kaikoura, New Zealand in the months of April-May3. 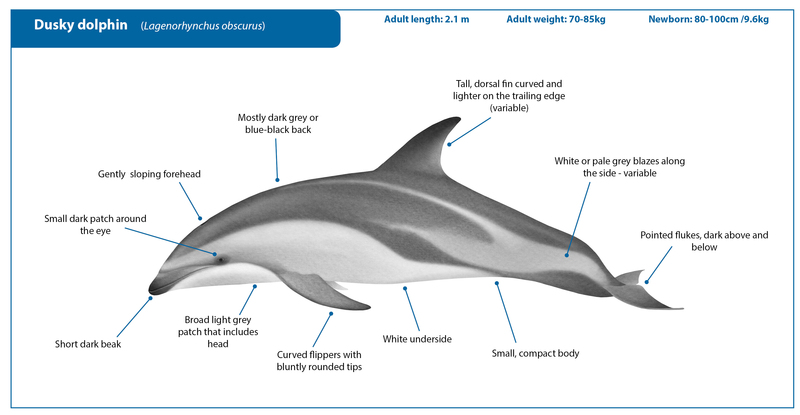 Life history characteristics of this species have been well studied in Peru, where a directed hunt for dusky dolphins has yielded a high number of specimens for detailed examination. Females are able to start reproducing between the age of 4.3 and 6.3 years (varying by population), and pregnancy lasts 12.9 months. Calves nurse for approximately 12 months, and a female normally rests for 3-4 months before conceiving again6. Dusky dolphin in South Africa Photo courtesy of Simon Elwen/Sea Search. Killer whales prey on dusky dolphins, which have been known to enter into shallow water to avoid detection and predation when killer whales are in the area2. A wide range of diseases and parasites have also been documented in dusky dolphins, particularly in Peru where many specimens have been available for detailed study7-10. Like most small cetacean species, particularly those that inhabit coastal waters where trawling and gillnet fisheries are common, dusky dolphins are subject to bycatch in fishing gear. In the past bycatch has been high in New Zealand and Argentina11, but the most significant bycatch has occurred in Peruvian fisheries12-14. Historically Peru also hosted a targeted catch of thousands of individuals per year12,13. Although targeted catches have been banned since 1994, bycatch continues, and it is believed that a targeted hunt for human consumption and use as bait in shark fisheries persists as well14. In New Zealand, as well as Argentina, there are concerns that pervasive and persistent presence of whale-watch tour vessels is impacting populations 15-19 (see more below). Despite the fact that catches off the coast of Peru have been well documented and are almost certainly not sustainable12-14, at the time of the last IUCN Red List assessment, this species was considered Data Deficient due to a lack of accurate abundance data from throughout its range20. 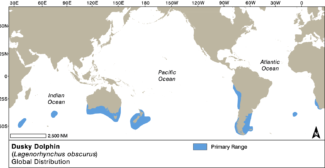 Dusky dolphins are listed on Appendix II of the Convention on Migratory Species (CMS). Close-up of dusky dolphin flank and dorsal fin showing distinctive blaze and markings. Photo courtesy of Monique Laubscher, Namibian Dolphin Project. Dusky dolphins close to shore. Photo courtesy of Simon Elwen, Namibian Dolphin Project. Despite their rather restricted range, dusky dolphins are a frequent target of dolphin-watching activities, particularly in Argentina (Patagonia), New Zealand and South Africa. Their acrobatic aerial behaviour, and the relative ease with which they can be approached by boats, make them rewarding species to watch. In New Zealand they have been the target of a long-standing swim-with dolphin programme in Kaikoura Bay. In both Argentina and New Zealand studies have shown that the presence of tour boats (and swimmers) changes dolphins’ behaviour, reducing the time they spend feeding and resting, potentially leading to negative long term impacts on their wellbeing15-19. For this reason, it is of the utmost importance that tourists choose operators who respect national or local dolphin watching guidelines to minimise the potential impact of whale watching on the animals that are being watched. 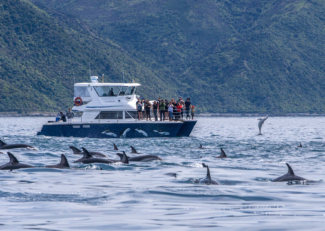 Dusky dolphins with dolphin watching vessel in Kaikoura, New Zealand. Photo courtesy of Dennis Buurman. Cassens, I. et al. Evidence for male dispersal along the coasts but no migration in pelagic waters of dusky dolphins (Lagenorhynchus obscurus). Molecular Ecology 14, 107-121 (2005). Van Waerebeek, K. & Würsig, B. Dusky Dolphin Lagenorhynchus obscurus in Encyclopedia of Marine Mammals (eds W. Perrin, B. Wursig, & J.G.M. Thewissen) 819-821 (Elsevier, 2009). Markowitz, T., Harlin, A. D., Wursig, B. & McFadden, C. J. Dusky dolphin foraging habitat: overlap with aquaculture in New Zealand. Aquatic Conservation: Marine and Freshwater Ecosystems 14, 133–149 (2004). Benoit-Bird, K. J., Wursig, B. & McFadden, C. J. Dusky dolphin (Lagenorhynchus obscurus) foraging in two different habitats: Active acoustic detection of dolphins and their prey. Marine Mammal Science 20, 215-231 (2004). Pearson, H. C. Unravelling the function of dolphin leaps using the dusky dolphin (Lagenorhynchus obscurus) as a model species. Behaviour 154, 563-581, doi:doi:https://doi.org/10.1163/156853... (2017). Van Waerebeek, K. & Read, A. J. Reproduction of dusky dolphins, Lagenorhynchus obscurus, from coastal Peru. Journal of Mammalogy 75, 1054-1062 (1994). Van Bressem, M.-F. & Van Waerebeek, K. Epidemiology of poxvirus in small cetaceans from the Eastern South Pacific Marine Mammal Science, 371-382 (1996). Van Bressem, M.-F., Van Waerebeek, K., Garcia-Godos, A., Dekegel, D. & Pastoret, P.-P. Herpes-like virus in Dusky Dolphins, Lagenorhynchus obscurus, from Coastal Peru Marine Mammal Science, 354-359 (1994). Van Bressem, M.-F. et al. Genital Diseases in the Peruvian Dusky Dolphin (Lagenorhynchus obscurus) 122 277 (2000). Van Waerebeek, K., Reyes, J. C. & Alfaro, J. Helminth parasites and phoronts of dusky dolphins Lagenorhynchus obscurus (Gray, 1828) from Peru. Aquatic Mammals 19, 159-159 (1993). Dans, S. L., Alonso, M. K., Pedraza, S. N. & Crespo, E. Incidental catch of dolphins in trawling fisheries off Patagonia, Argentina: can populations persist? Ecological Applications 13, 754-762 (2003). Majluf, P., Babcock, E. A., Riveros, J. C., Schreiber, M. A. & Alderete, A. Catch and Bycatch of Sea Birds and Marine Mammals in the Small-Scale Fishery of Punta San Juan, Peru. Conservation Biology 16 1333-1343 (2002). Van Waerebeek, K. A note on the status of the dusky dolphins (Lagenorhynchus obscurus) off Peru in Gillnets and Cetaceans Vol. Special Issue 15 (eds W. F. Perrin, Gregory Donovan, P., & J. Barlow) 525-528 (Report of the International Whaling Commission, 1994). Mangel, J. C. et al. Small cetacean captures in Peruvian artisanal fisheries: High despite protective legislation. Biological Conservation 143, 136–143 (2010). 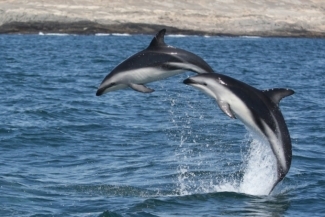 Barr, K. & Slooten, E. Effects of tourism on Dusky dolphins at Kaikoura 1-30 (1998). Dans, S. L., Crespo, E. A., Pedraza, S. N., Degrati, M. & Garaffo, G. V. Dusky dolphin and tourist interaction: effect on diurnal feeding behavior. Marine Ecology Progress Series 369, 287-296 (2008). Dans, S. L., Degrati, M., Pedraza, S. N. & Crespo, E. A. Effects of Tour Boats on Dolphin Activity Examined with Sensitivity Analysis of Markov Chains. Conservation Biology 26, 708-716, doi:10.1111/j.1523-1739.2012.01844.x (2012). Lundquist, D., Gemmell, N. J. & Würsig, B. Behavioural Responses of Dusky Dolphin Groups (Lagenorhynchus obscurus) to Tour Vessels off Kaikoura, New Zealand. PLOS ONE 7, e41969, doi:10.1371/journal.pone.0041969 (2012). Hammond, P. S. et al. Lagenorhynchus obscurus in The IUCN Red List of Threatened Species (http://www.iucnredlist.org/det... Consulted October 2017, 2008).